Hello, dear friends. Are you wanted to know all information about ASA University Bangladesh? If you are, then read this article. Here, we are going to give a tour of this private university. In this article, we have discussed all the latest and official information of this university. And, we have also written the tuition fee structure, admission requirements, and facilities of this university. So, you will find all the details in the below article. ASA University Bangladesh is a leading private university in Bangladesh. This university established in 2006 under the private university Act 1992. It is located in Shyamoli, Dhaka, Bangladesh. It is associated by the University Grants Commission Bangladesh. Its premier Vice-Chancellor was Prof. Md. Muinuddin Khan. And, this university has many qualified and skilled teachers. Now, do you know this university has only one campus! Actually, it is quite a new private university. But, it has marked its place in the leading university list. This university gives 15% to 100% scholarship to the meritorious students under the basis of HSC result. Total 1831 students study here. And, it has 2 labs with PC and the internet connection. This university provides standard education with cheap cost. 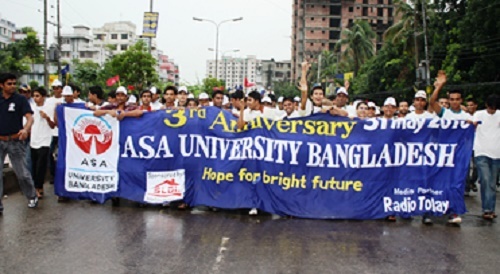 ASA University Bangladesh provides top class courses and programs on their university. And, those programs duration is 4 years. Every course consists 8 semesters with the international syllabus. The programs are BBA, MBA, MA, B.A, LL.B, LL.M, B. Pharm, and B.Sc. But, Finance, Accounting, Marketing, HRM, Management, MIS are the major courses in MBA in this university. And, ASA University Bangladesh has some upcoming courses which are given below. BSS in Journalism & Mass Communication. MSS in Applied Sociology and Development Studies. MSS in Journalism & Mass Communication. Sc. in Electronics & Telecommunication Engineering. Now, it is important to know the tuition fee in ASA University Bangladesh for graduates and post-graduates. This university provides quality education with low cost. The total costs of BBA are 4, 75,800, and cost of MBA depends on credit. And, LL.B costs 3, 37,000 and LL.M cost 63,500. Besides, the total cost of BA and MA is 2, 81,000 and 55,250. The students who want to admit ASA University Bangladesh must full-fill some requirements. Then they can apply here. And, those requirements are. They students must pass the SSC and HSC exam with second divisions or minimum GPA 2.5. The ASA University Bangladesh has a large library which contains many books, journals, newspapers, magazines etc. The library is capable of handling 200 students at a time. And, the students can continue their research here with peace and quiet. Finally, we hope you have found much info about this university. And, visit our website for updates about ASA University Bangladesh.